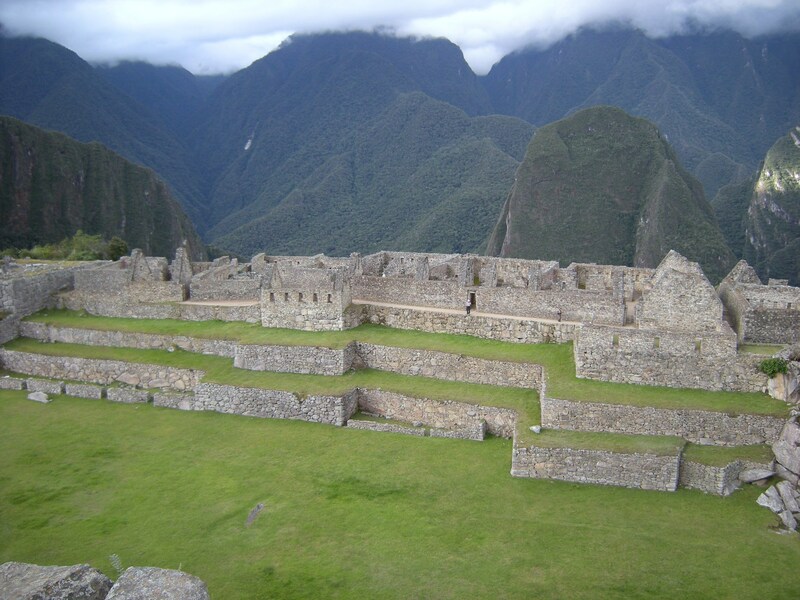 It was June 28, 2008 that my husband, son and I visited Machu Picchu as part of a 14-day trip to Peru with the program Overseas Adventure Travel. 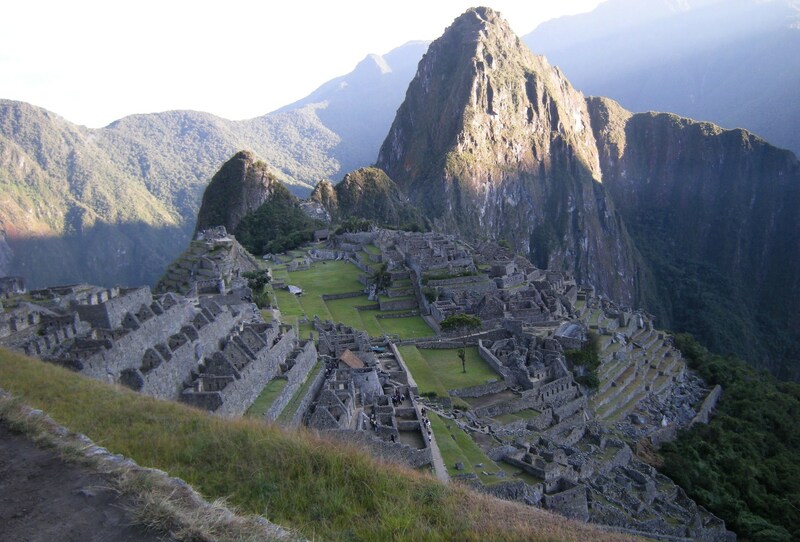 Machu Picchu was at the top of my “bucket” list for travel destinations. It was an experience I will never forget. 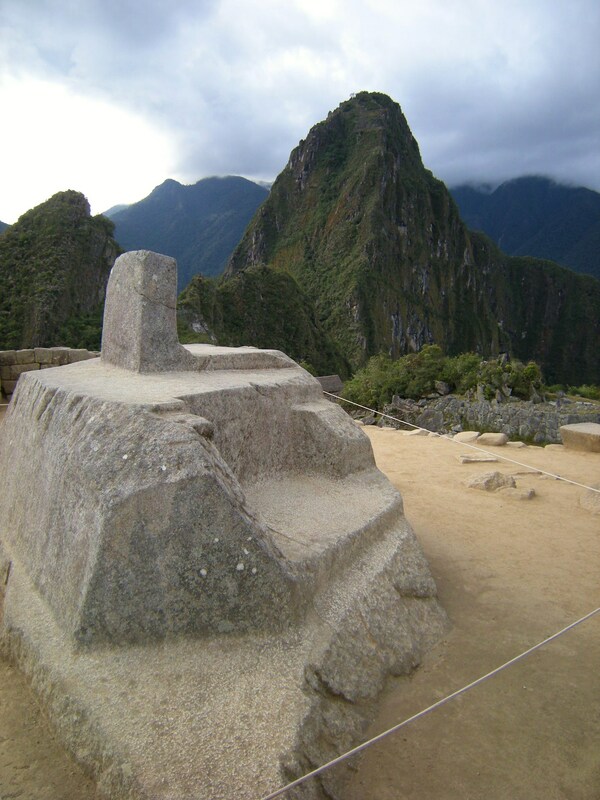 The Intihuatana, or “hitching post of the sun”, stands at the uppermost point of Machu Picchu. 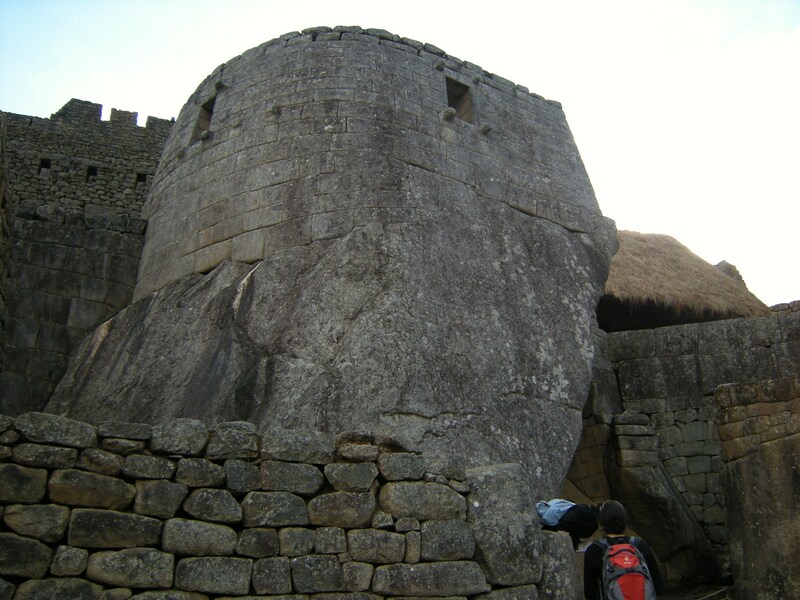 It is a rather simple but elegant structure, a smooth rectangular protrusion from a larger more angular base, itself rising from a rock fitted and shaped so neatly on the ground as to seem to be rising directly out of it. Perhaps a natural rock formation was used and carved directly on this spot, but it had to be very specifically placed. 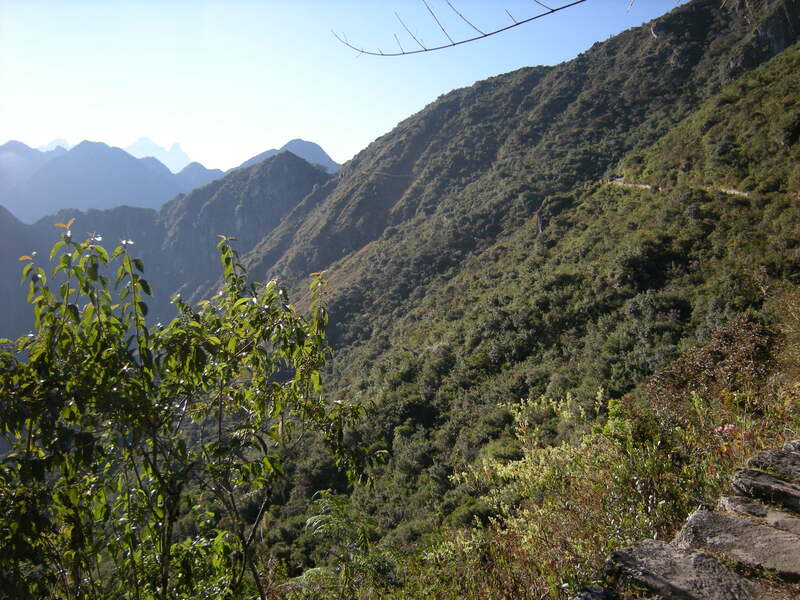 From this spot the Intihuatana marked the spring and autumn equinoxes (not the solstices as many people think) by “hitching” the sun’s shadow in perfect alignment with other nearby Intihuatana sites, including Llactapata, about 4 miles away. 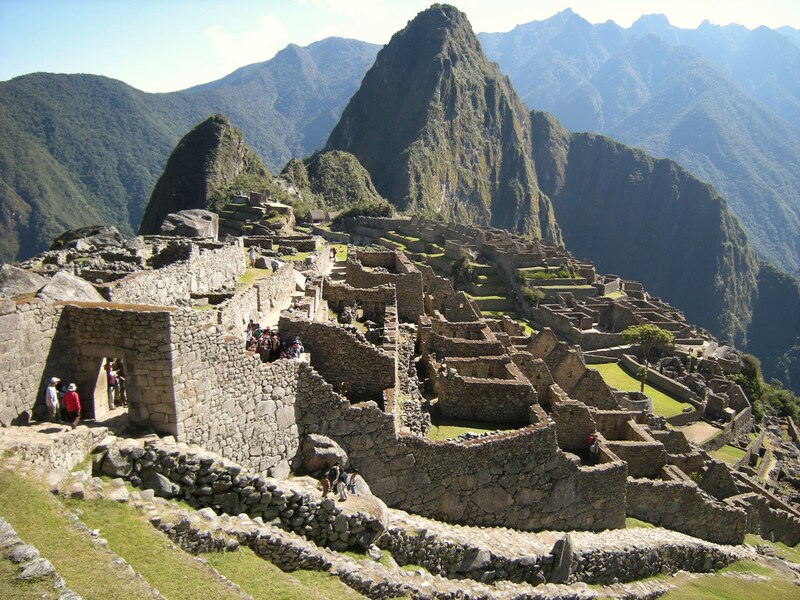 There are four such sites, marking the four regions of the Inca Empire with the alignment of the sun every March and September. Because tourists used to have their pictures taken sitting on this sacred rock, chipped pieces out of it to forever hold its energy or write graffiti on it, it has now been roped off to protect it from further abuse. It, however, is said to be another vortex from which one can derive special energy. Again, people put their hands near it to feel its power, careful not to trespass its sacred space. 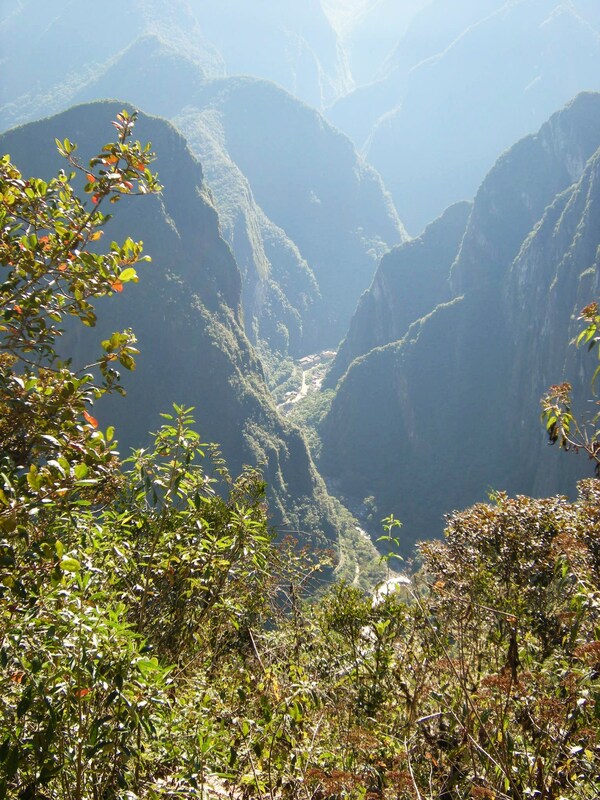 Although there are a few more sights to see by continuing on the path along the western side of the Main Plaza to the point where both sides meet at the base of Huayna Picchu, we doubled back at this point, to visit a few more of the most important highlights of this lost city which now admits 2,500 tourists each day. 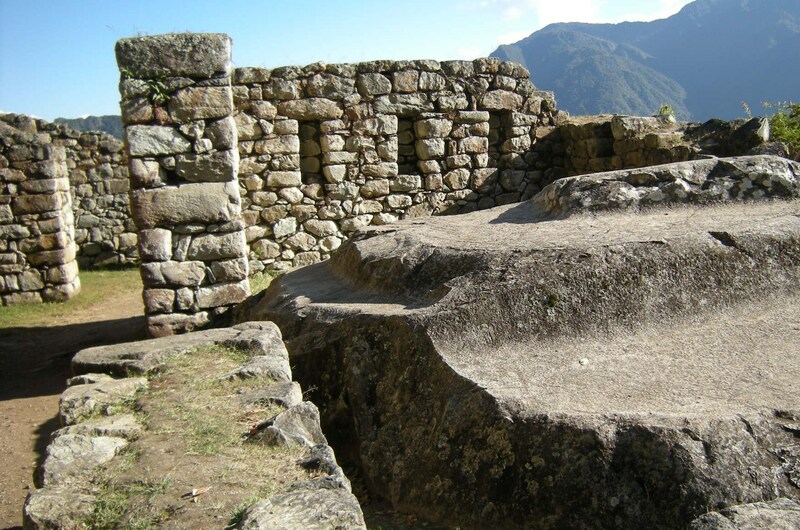 As we descended a stairway dividing the dwellings of the common people on our right from those of the royalty, we could see below us one of the few curved structures at Machu Picchu, the Temple of the Sun. Boris indicated its unique structural features of being constructed using rectangular stones lined up carefully with a certain degree of concavity and convexity that follows mathematical rules of pi and higher geometry that I do not understand. These walls, because of their slight slope, are actually able to withstand the forces of nature and earthly tremors better than others. 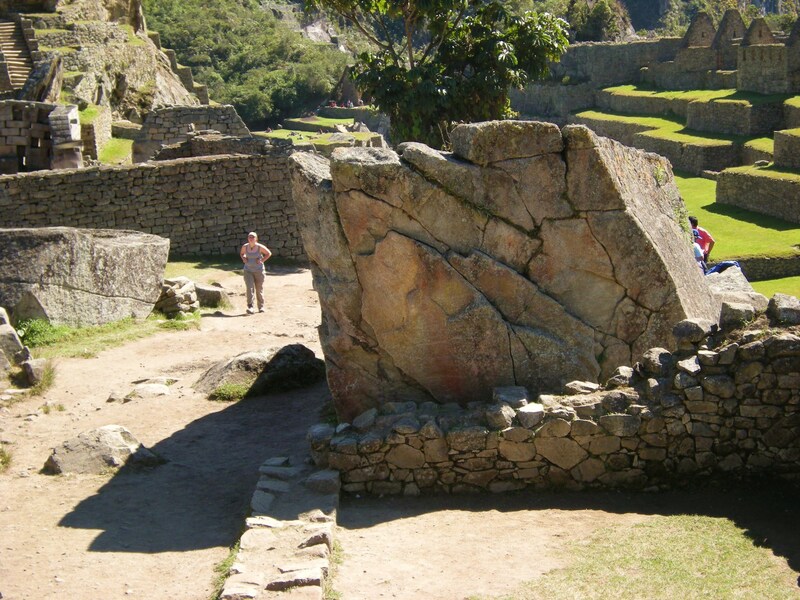 Another example of this that we were to see later was the Qoricancha in Cusco. The circular structure of this temple also served for precise astronomical measurements, including the solstices of December 22 and June 22 during which the sun’s rays would enter exactly through windows along the walls, which were placed perfectly for this purpose, forming a 90 degree angle within. 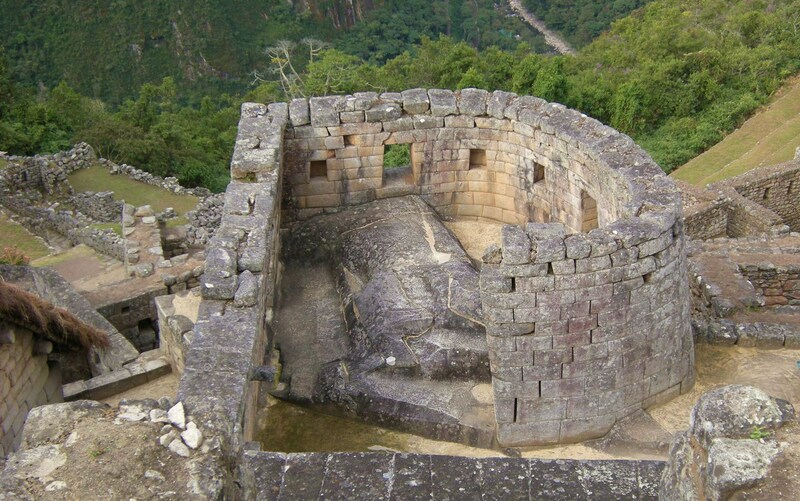 The floor of this temple is not flat, but instead covered with a natural rock smoothed and shaped into a mound with lines and grooves for steps. To me it looked something like a puma although no one confirmed this. Someone was saying something behind me, pointing downward. 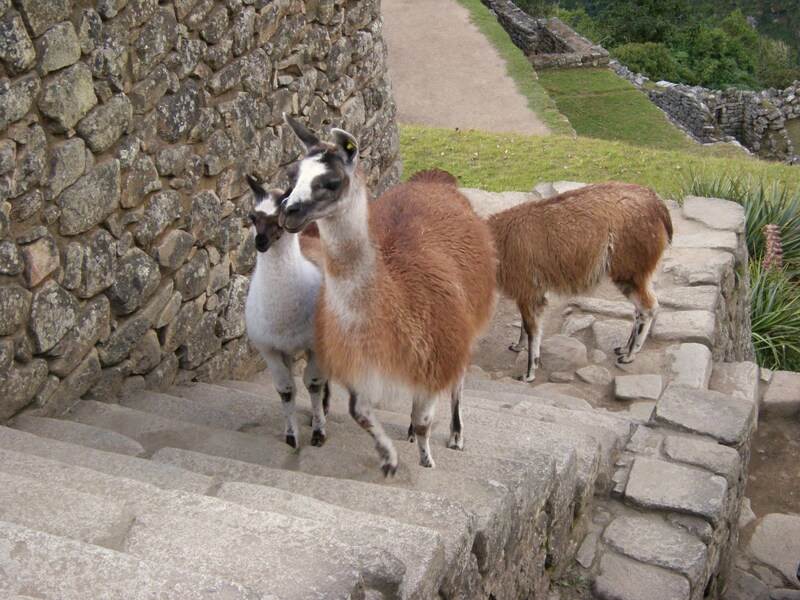 I looked at where they were pointing and saw three llamas at the base of the steps, obviously wanting to climb them. They patiently waited while a group of tourists passed them on the way down, even allowing their picture to be taken by several. When the way was clear, they placidly ascended, not posing for us, but not opposing us either. 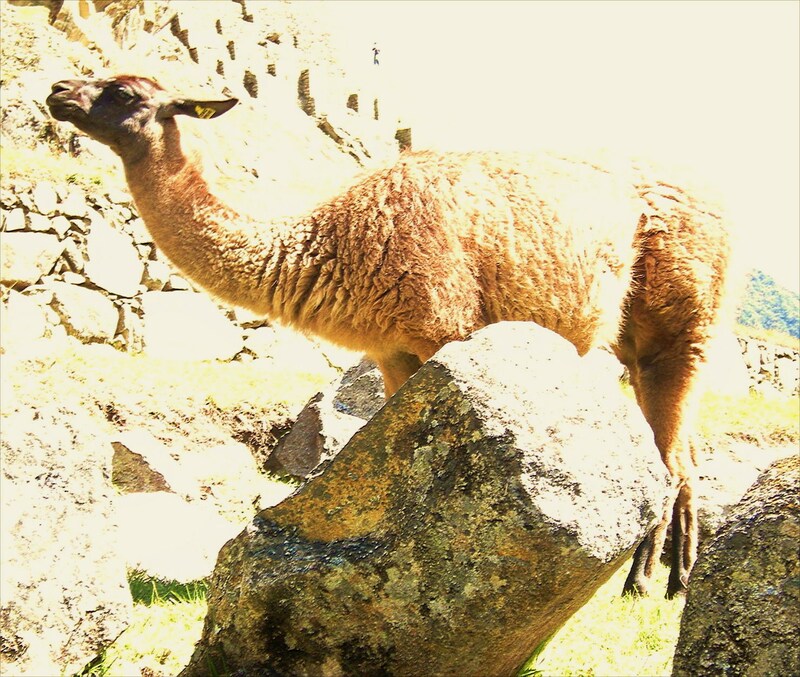 We stood out of their way, content with pointing our cameras at them, delighted with having “wild” llamas come so near us! 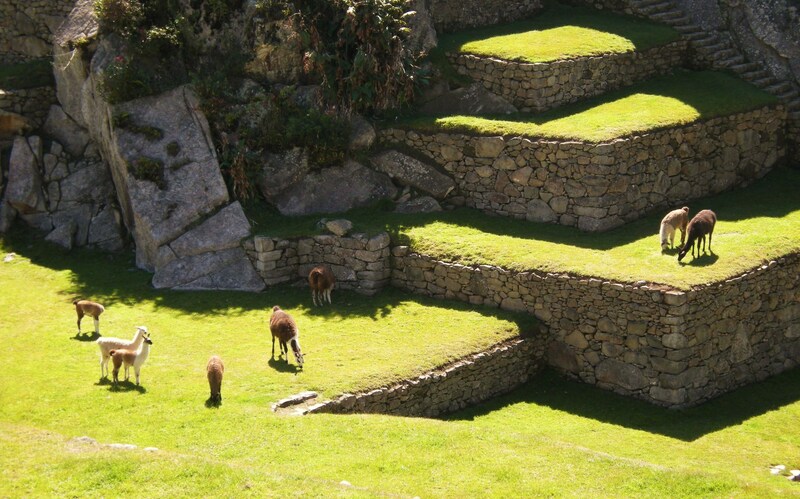 In fact, there are many llamas here, grazing on the terraces and on the plazas. They live in harmony with this place as they have for centuries, and now live in peace with the tourists, each staying out of the other’s way. After coming down the stairway and passing through trapezoidal doorways we came to a small cave known as the Royal Tomb, allegedly the burial place of a princess. However, no bones were found here. 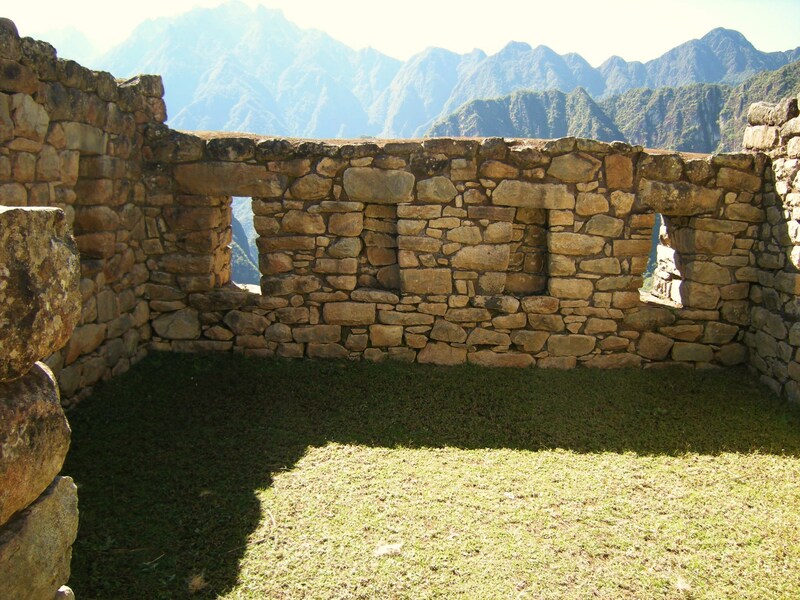 This site looks like a modern art sculpture or painting, and I began to wonder if indeed the Incas inspired some of today’s artists. Richard Danbury in his book The Inca Trail: Cusco and Machu Picchu describes it as the rocks being carved in “three dimensional asymmetry so that they look as if they’re made of putty.” Whether it was a tomb or not, it has been shaped impressively so it was obviously an important place for the Incas. The smoothness of the shaped steps and the asymmetry in form actually gave me a sense of awe and peace. 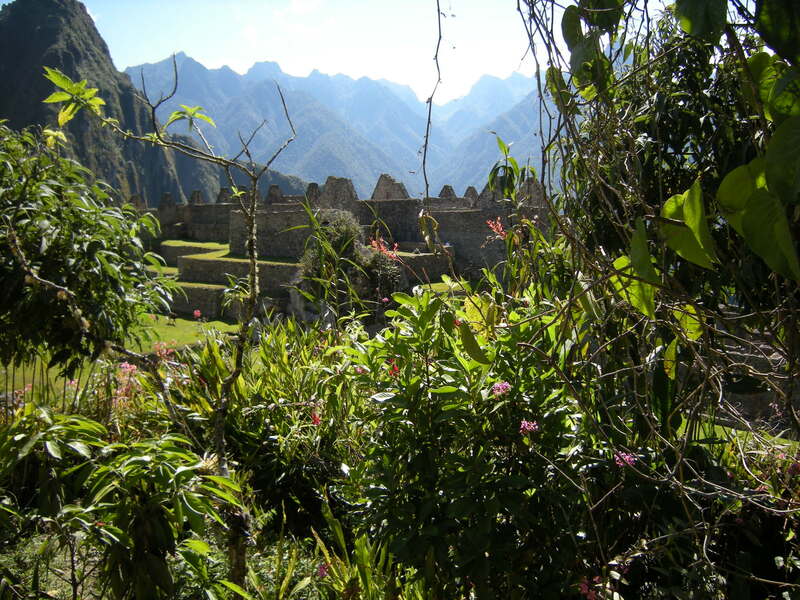 This and the Temple of the Condor were my favorite places at Machu Picchu in that they inspired in me a feeling of harmony with nature in the juxtaposition of the natural and manmade. 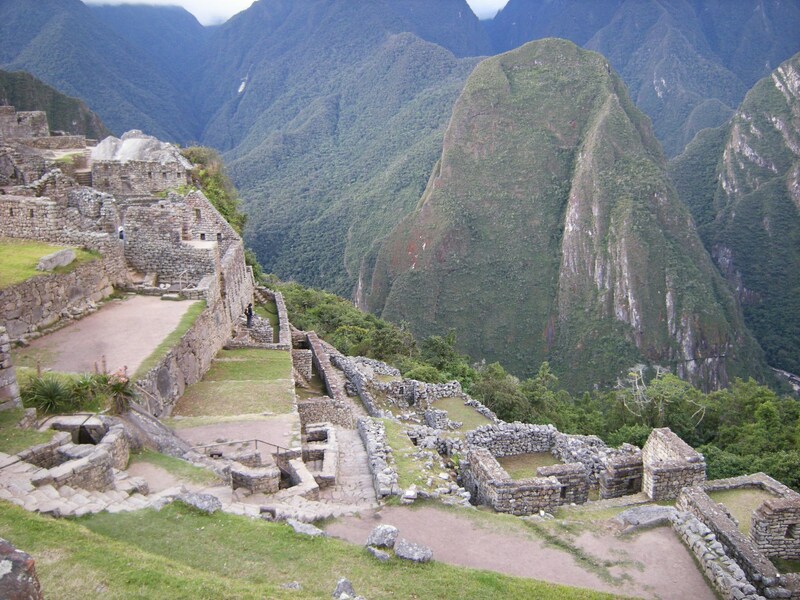 From here there is also a nice panoramic view of the east side of the ruins and the mountain range beyond. 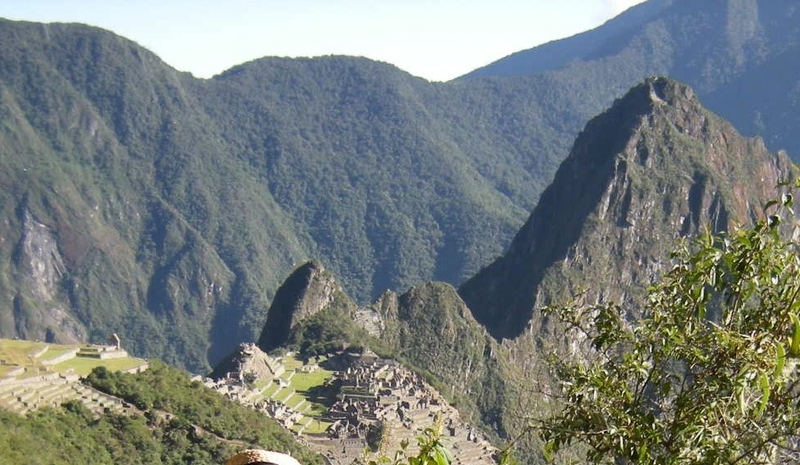 Also from this spot we got a good view of the Temple of the Sun from the outside, its perfectly aligned, slightly inwardly slanted stone walls rising up above an outcrop of rock, as if the rock itself had lifted the temple upward from the ground as an offering to the sun god. 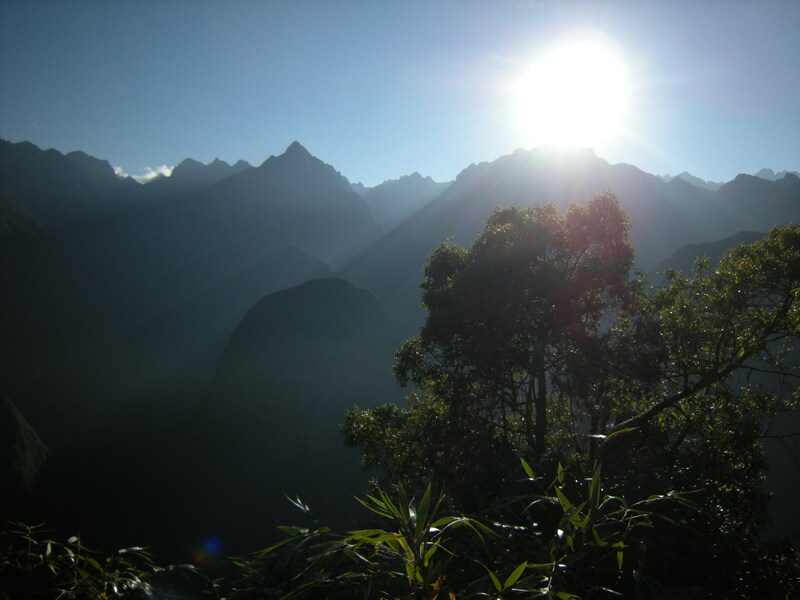 As the sun began to sink behind the western mountains and the low clouds settled behind Huayna Picchu, we took our last photos and paused once again to marvel at the beauty of this once hidden place. Tomorrow morning we would be back early to explore again on our own. On our return to the village, we went to dinner at a local restaurant where we were serenaded by a band playing native instruments. They were selling their CD, which I purchased. The restaurant had an interesting décor and I wished I had my camera. On one of the walls were a series of carvings of all the Inca kings, an artist’s caricatured but interesting interpretation of each. Most had some exaggerated features and unusual but probably realistic hairstyles and adornments. 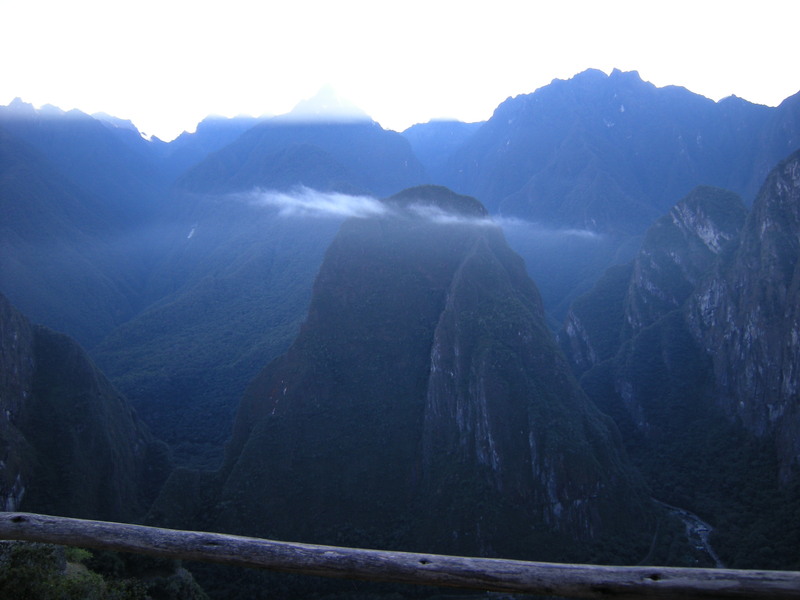 The majority of our group woke up very early to return to Machu Picchu as close to dawn as possible. 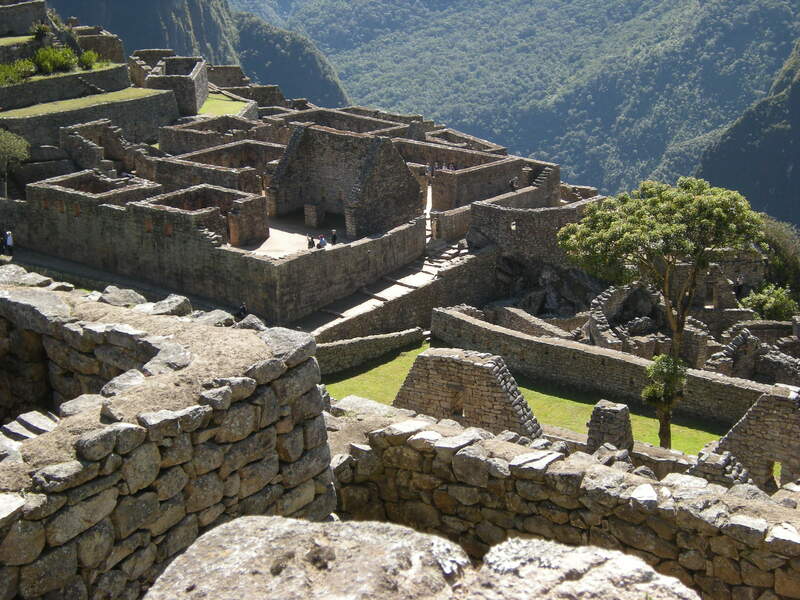 The plan was to take the Inca Trail up from Machu Picchu to the Sun Gate (Inti Punku), from which you get wonderful views of the plateau of the citadel. Boris did not go with us; instead we would be guided by Ronaldo, the assistant guide we had met yesterday. 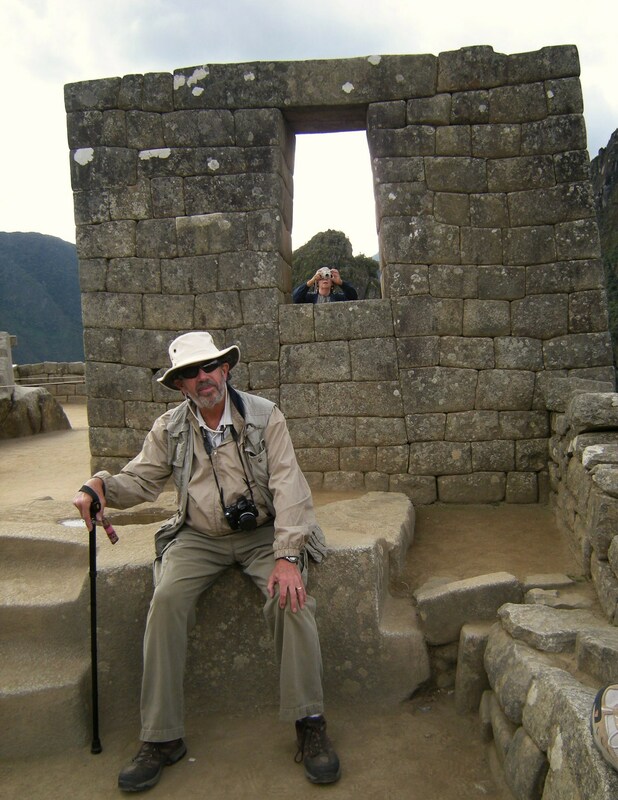 Dale did not go with us, preferring to get up a little later and go back to Machu Picchu and explore on his own; one couple preferred to stay in the village and shop or look around, and another woman decided to stay behind and attend mass at the little church on the square of Aguascalientes. 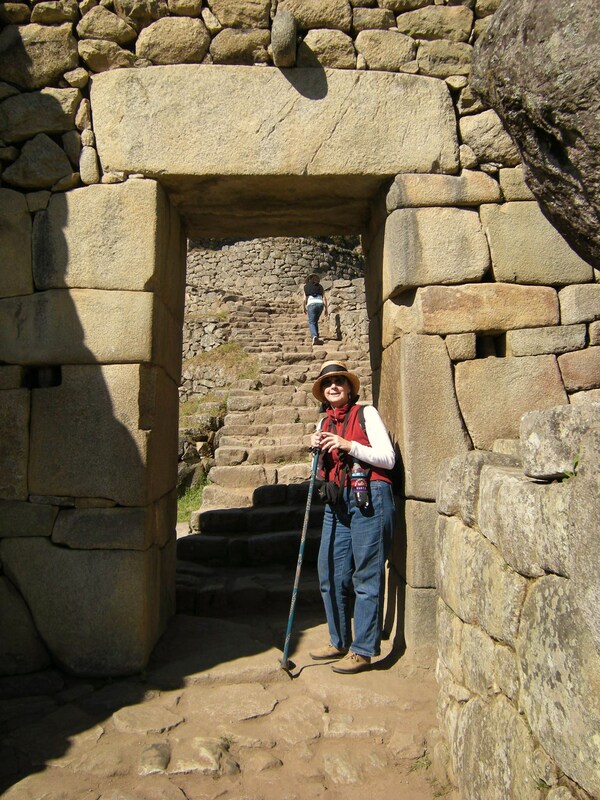 We were served an early breakfast (the hotel restaurant opened for breakfast at 5:30) and then, equipped with our walking sticks, hats, sunscreen, sunglasses and hiking boots, we walked to the bus stop and took one of the early buses up to the ruins. We were not the first, however, and I was somewhat disappointed to find that by the time we arrived, close to 7 am, there were already quite a few tourists meandering in the ruins, the majority of them young hikers. 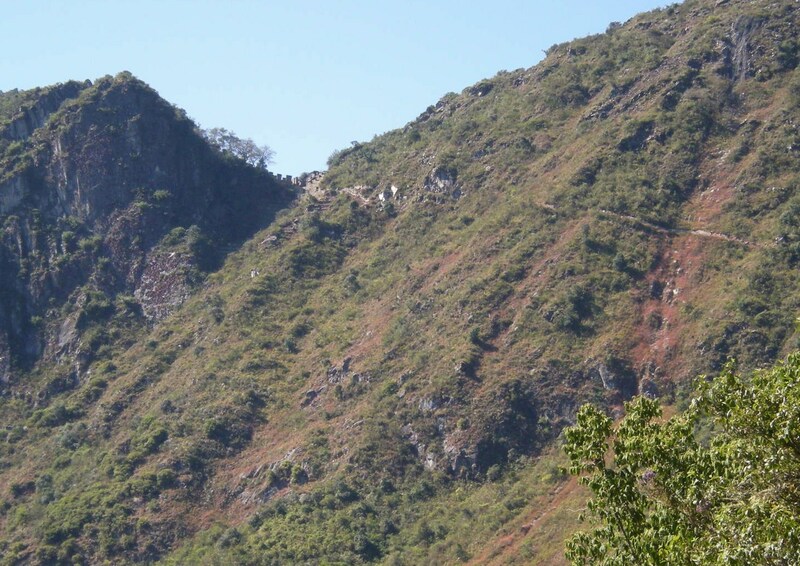 The trail rose up at about a 45 degree angle to the south, away from the ruins. The path was made of gravel and large uneven stones, which made for somewhat difficult climbing. It wasn’t much of a problem for most of the group, but Christe and I lagged behind and discussed turning back if we felt we could go no farther. We decided not to try to push ourselves to go all the way up if we got too tired and to just enjoy ourselves. Of course, we stopped often along the way – everyone did. 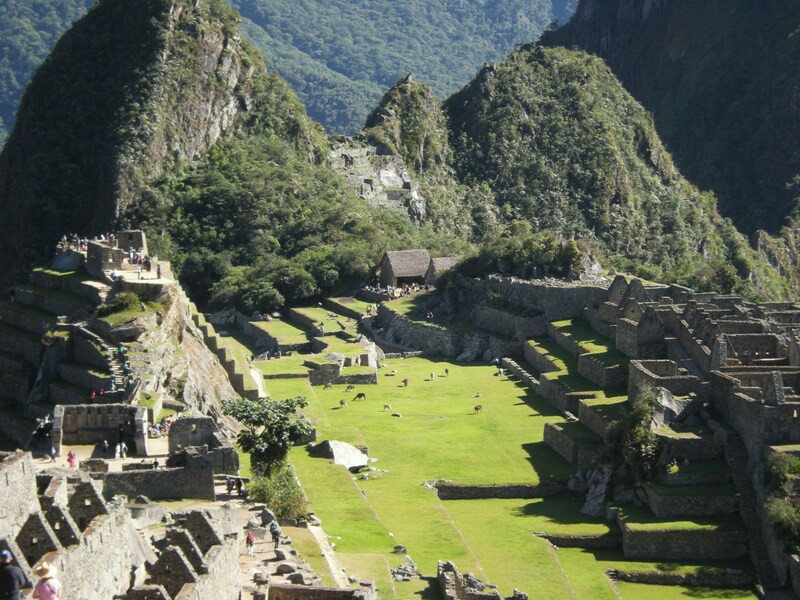 We kept looking back at Machu Picchu, growing smaller behind us and enjoying the breathtaking views of its situation among the towering peaks surrounding and protecting it. When we started along the trail, it was light, but the sun had not quite made its appearance over the top of the mountains. 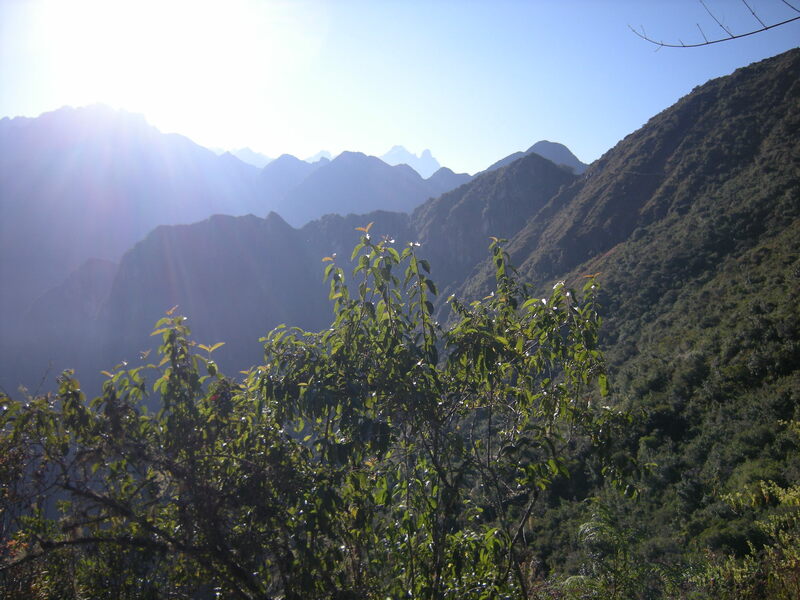 It was not long after we began our climb, however, that shafts of sunlight bathed the trail and the top of Huayna Picchu in a golden glow, no longer contained behind the craggy peaks. Soon the sun itself made its appearance, blocking out the top of the mountains with its brilliance. 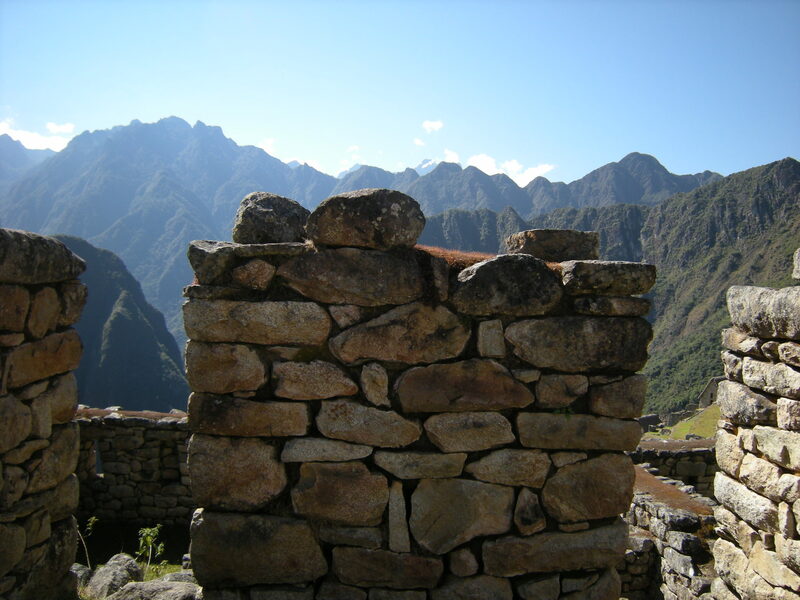 It is no wonder that the Incas named the dip in the pinnacle of the Inca Trail “Inti Punku” or Sun Gate. 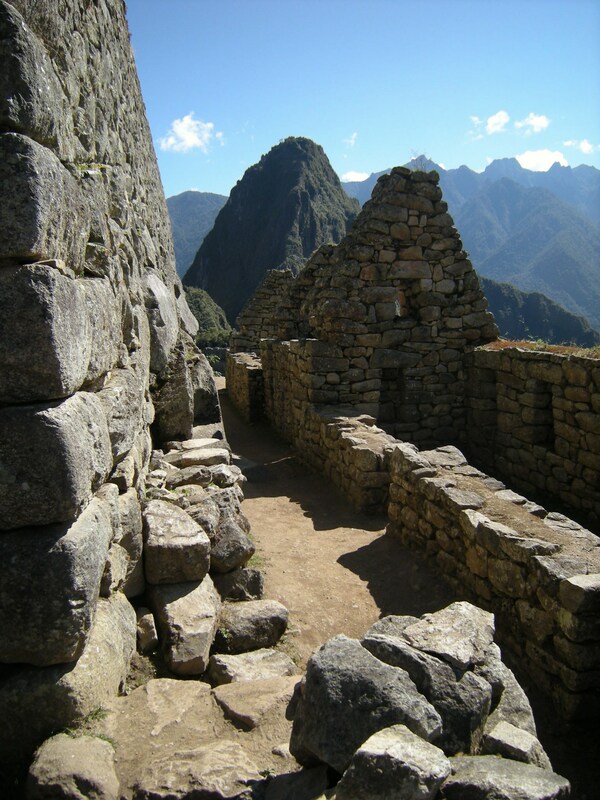 Along the trail, too, were ruins of buildings and possibly temples, and large rocks seemingly placed there deliberately for some purpose. For the most part, these ruins have not been restored. 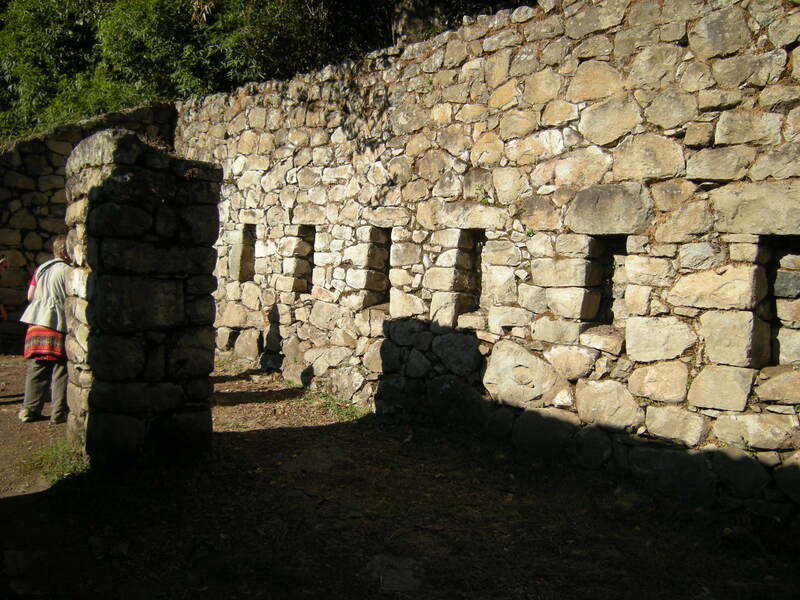 On some of the walls were neat piles of stones (called apachetas*), placed there by hikers, Ronaldo said, to mark their arrival at this point. 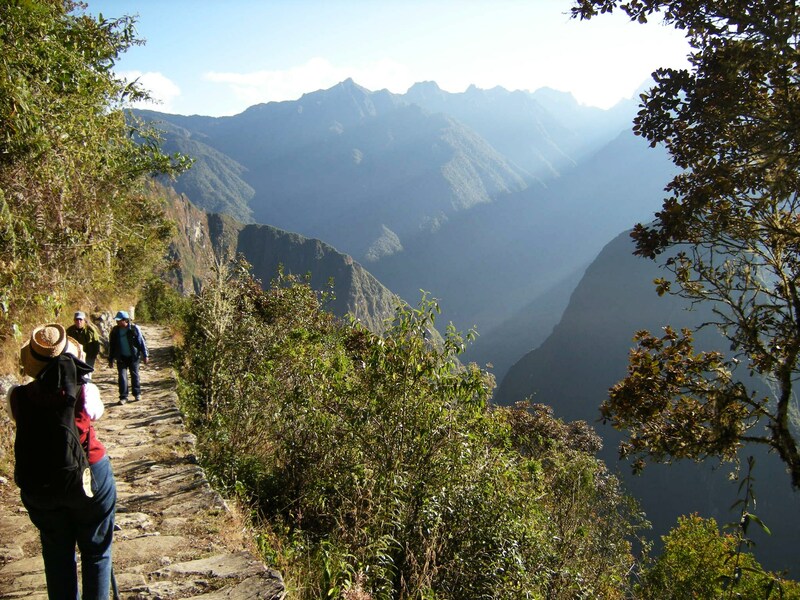 Most hikers on the Inca Trail approach Machu Picchu via the Inti Punku, after a long trek of 20-40 miles or more, and their first views of the “lost city” are from that point. 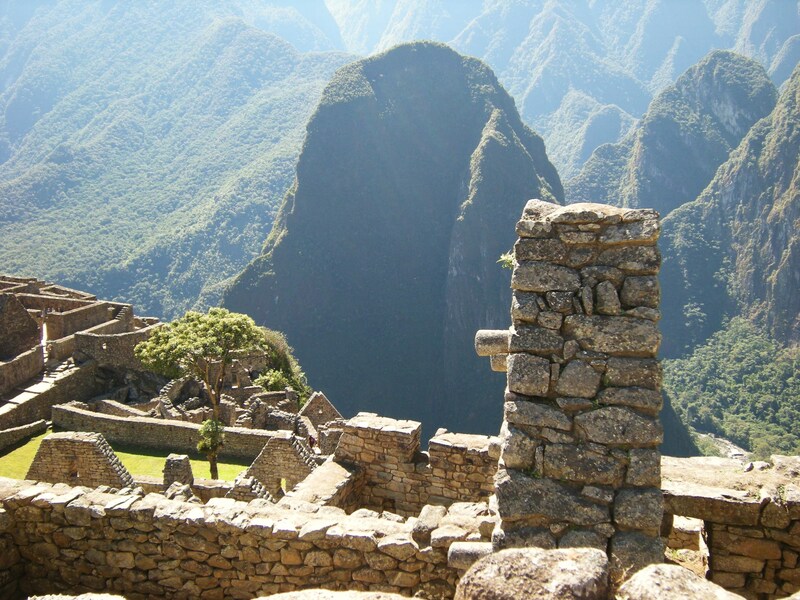 *I read in Mark Adams’ book Turn Right at Machu Picchu that people who come through a mountain pass create a new apacheta or add to an old one, for good luck or to ask a favor from the apus (gods). 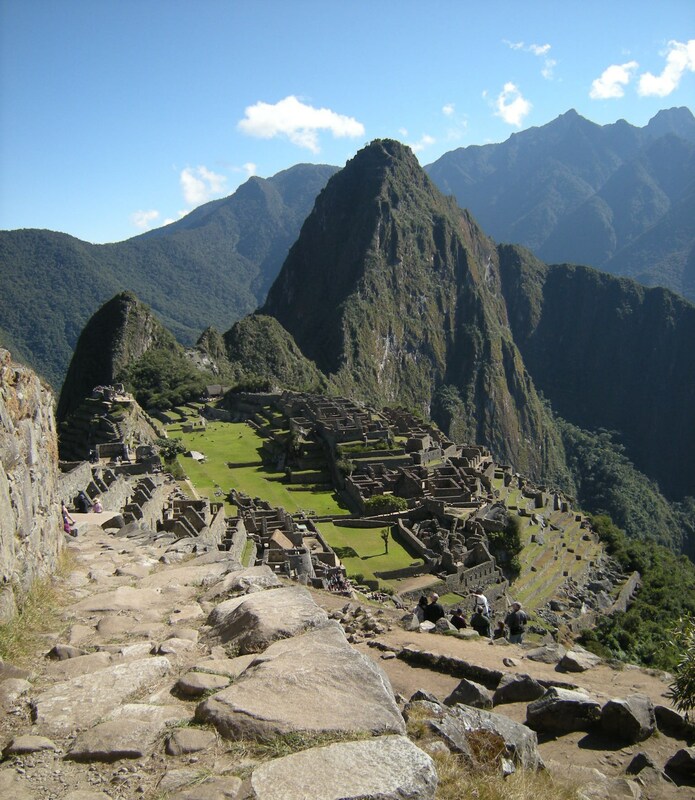 A little more than halfway up, Christe and I decided to turn back and spend the rest of our time leisurely exploring and enjoying Machu Picchu itself. We would meet the others later, if not back at the ruins then at the bus, since we had to be back in the village for lunch at noon. 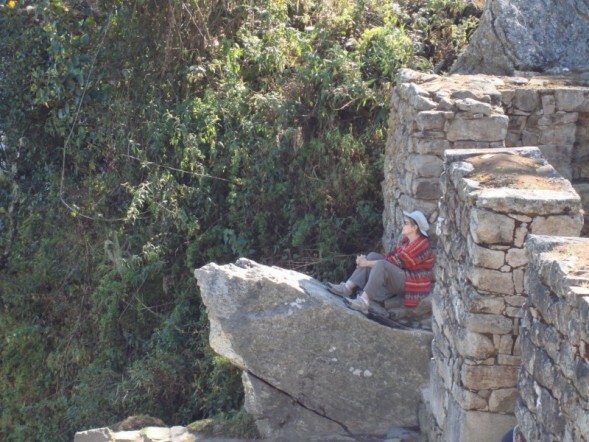 I didn’t make it to the top (Inti Punku) but one of those who did took this picture of Jayme contemplating the view from there. 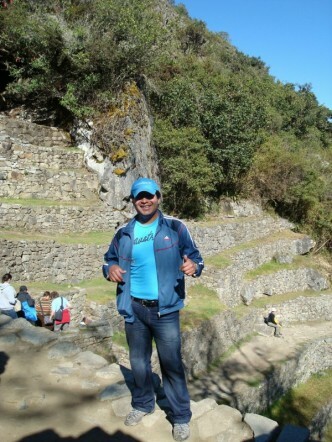 “We made it!” – Guide Ronaldo gives a thumbs up at Inti Punku. 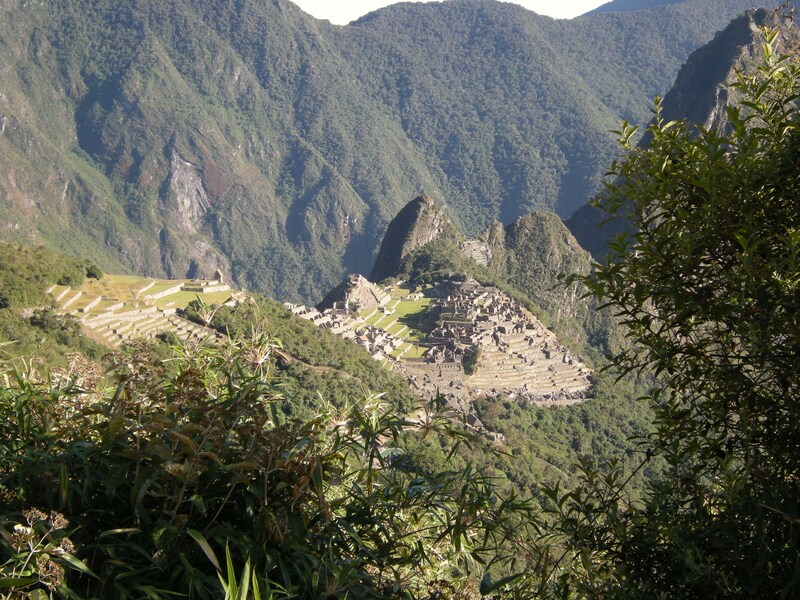 We descended the trail together and returned to Machu Picchu via the Main Gate. This was the original gate through which everyone in the ancient city was admitted. This entrance was guarded for security. 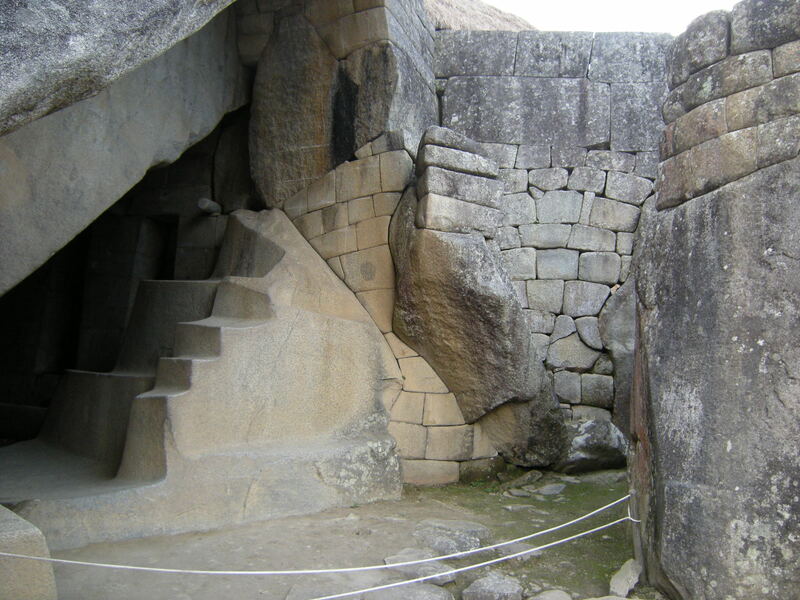 On the inside of the doorway, above the massive lintel over the entrance, is a ring carved in stone, and on either side of the doorway are two niches with vertical bars inside forming a kind of locking system. This entrance is surrounded by a wall, enclosing the urban area that was not protected either by a moat (now dry) or steep terraced slopes. 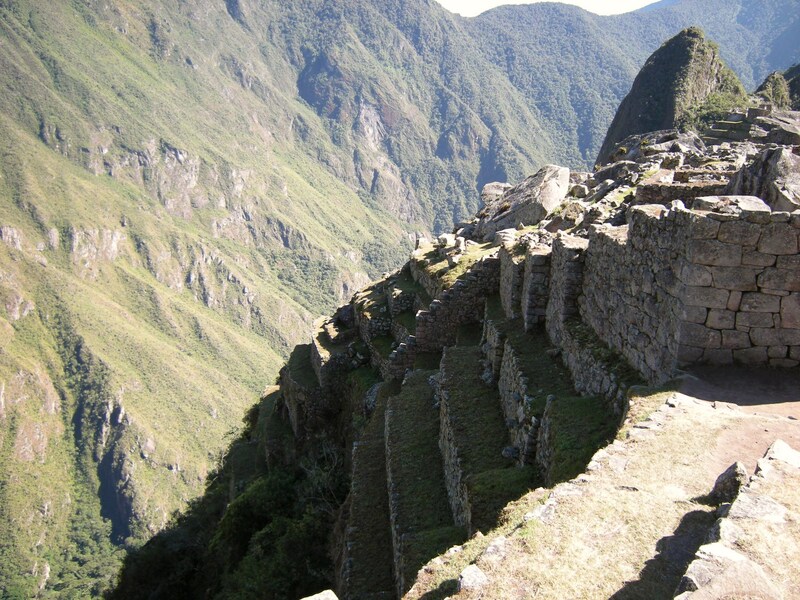 Northwest view of terraces from Main Gate – that’s a steep drop! We wandered through this part of the ruins, through narrow passageways separating small residences of commoners, passing through open areas and sitting down next to the garden to relax, converse and enjoy the view. Christe and I exchanged stories about our families. 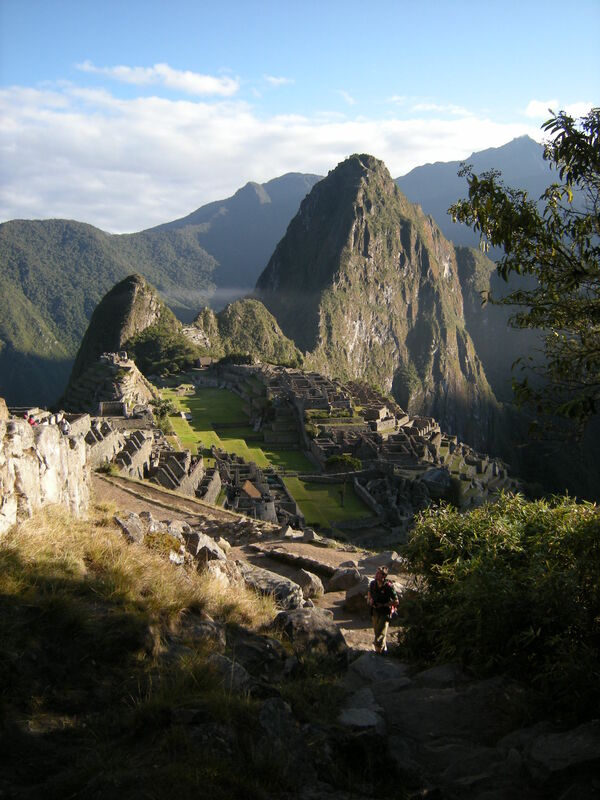 Even though Carol had given us her book about exploring Machu Picchu, complete with maps and explanations, we didn’t look at it much. We desired no specific agenda and knew of no “magical” spot that would be a culminating experience. 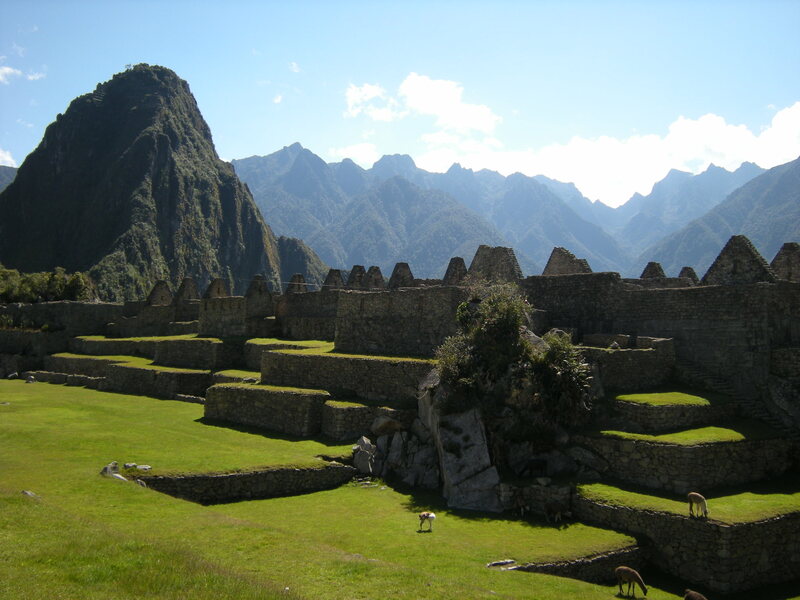 We sat for awhile adjacent to the main plaza and watched the llamas grazing there. There were young, frisky ones who scampered about, and we got close to a couple of adults, one of which eyed us as he chewed grass, seemingly annoyed by our close presence. Fortunately he didn’t spit at us! We kept scanning the tourists to see if we could spot any members of our group, or even Dale who was there by himself somewhere. An interesting group of hikers came by, dressed in white t-shirts with pink lacy bras imprinted on them. Most of them were women, but I saw even a couple of men dressed in these shirts! I stopped one of the hikers, a hefty woman with very pink, sunburned skin, to ask about the shirts and where they were from. In her British-sounding accent, she told me they were hiking to raise money for breast cancer research. Most of them were from Australia, but there were a few English and Canadians among them. 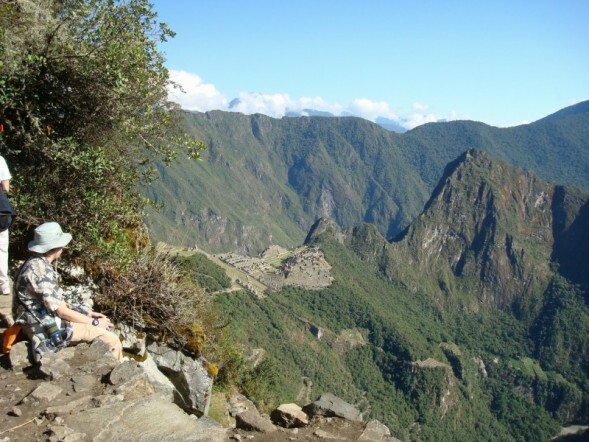 Many other hikers were young Americans, wearing colorful woven alpaca hats with ear flaps. These hats didn’t seem practical to me – they protect the head from the sun, but not the neck, and I thought these hats would be hot and scratchy, but many Peruvians also wear them constantly. Mornings are cool at this time of year, so perhaps they are not impractical. The hats just seemed incongruous with the rest of these hikers’ attire – sleeveless T-shirts and shorts or Capri pants. I had really wanted to be able to find a place to spend some quiet, meditative moments, but it was unfortunately difficult to do with so many people around to interrupt my reverie and impede my appreciation of the beauty around me. However, I did make an effort to spend less time taking pictures and more time just enjoying this amazing ancient creation and the harmonious relationship between the natural landscape and the shaping of it for human purpose. 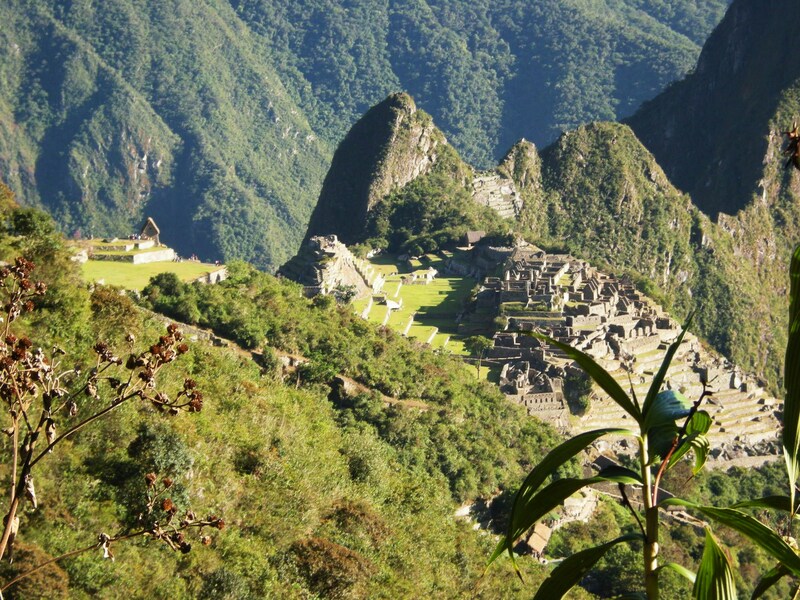 Machu Picchu makes clear the reverence that the Incas had for the land and its natural forms. At about 11 am, we headed back toward the tourist entrance, where we waited in the shade while some of us (by this time the Inti Punku trekkers had rejoined us) went to the bathroom or bought more bottled water. I felt a mixture of anxiety and sadness about leaving this place. It’s doubtful I will ever be back and I thought there was still so much to see and explore. I wish I had a couple more days to spend here, to come back at a leisurely pace. Still, we’d had two visits here, one in the afternoon and the other in the morning so we had been able to appreciate the majesty of this place in different interplays of light and shadow. 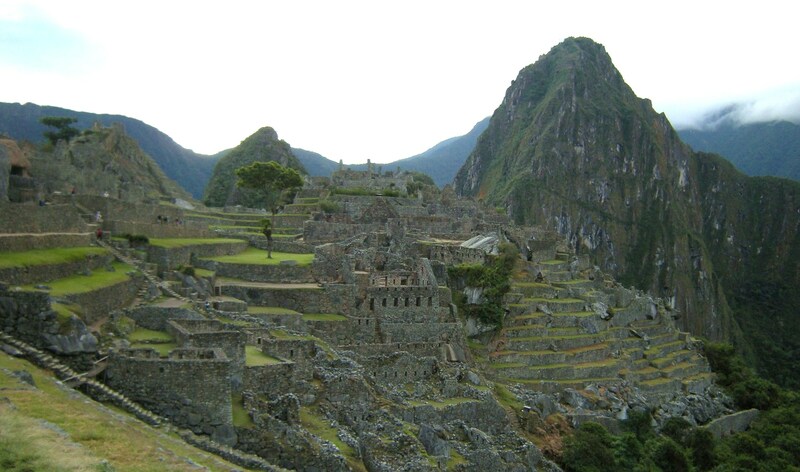 And there was so much more of Peru to look forward to. 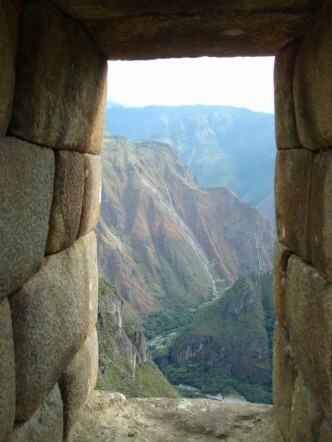 Sharon took this picture of the view through a doorway, and later used it in an art piece! 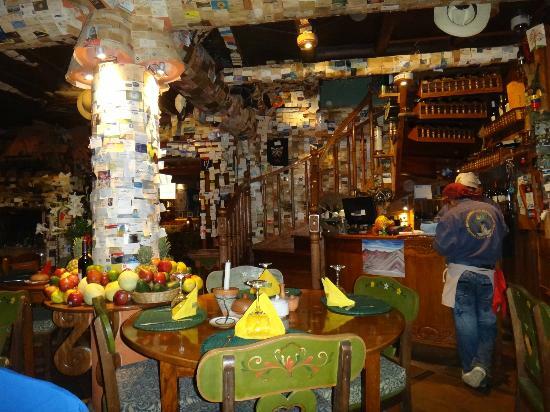 Back in Aguascalientes, we met up with our whole group at the restaurant Indio Feliz. Everyone agreed that this was an excellent restaurant, both the food and the ambiance.